A COUPLE of fishermen had frightening but thrilling encounter with a great white shark north of Wellington. Two fishermen in a 12-foot aluminium dinghy got a fright at Pukerua Bay, when a shark almost as big as their boat tried to steal a blue cod off their line. Shark expert Clinton Duffy says a lot of great whites return to New Zealand waters from the tropics at this time of year. 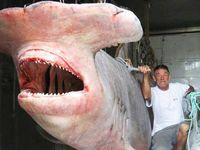 "They are completely different from any other shark you are likely to encounter, and around the coast of New Zealand they are much bigger and much heavier set than any other shark of the same length. "Obviously they are not really afraid of very much." Clinton Duffy says great whites don't often attack boats, and when they do it is usually only when they are teased with bait.